I present to you a new kind of game, one that involves cats swords aliens and possibly more. The name of the game is Armed Cats. It is a fighting game as one would expect and it is for the Casio Prizm. I haven't anything to show right now. I want this to be a 3d game however I have no 3d modeling experience. So I will need to figure out some way to make a good looking cat in a 3d modeling program most likely blender so I will read the manual and/or watch videos. If it turns out that I really have no artistic skill even after getting good at some software I may either see if someone else is willing to do it or pull free models from the internet if existing. Before I do that I will need to write a software render or maybe as a last resort use an open source one but it would be more fun to do my own. 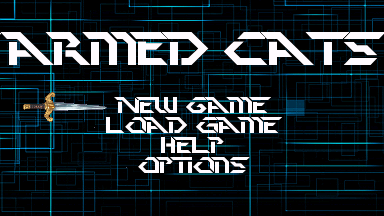 I also plan for there to be lots of procedural content in the game but I doubt a cat could be generated easy. I will of course experiment. Anyway just posting this in order to see what people think of the concept and if anyone has any suggestions/tips or other relevant things to say please post them. I would like to hear regardless of weather it is negative or positive. Yes I could add lasers. How about real guns in addition? No that is anything but real, I am talking rifles pistols and such. I will have to see if I should make the game more serious or funny. I am thinking a more serious route. Are you thinking futuristic or current? How many weapons will the cat have in his inventory? Maybe a variety of different weapons. A low accuracy spray weapon, a high accuracy low fire rate and high damage rate weapon, a medium fire rate medium accuracy and medium to high damage rate weapon, and high fire rate medium/low accuracy low damage weapon. Just a few different weapon statistics so every player can play with a weapon they want. I was actually planning a combination of historical current and futuristic all in one. This will make more sense once I am done but consider this example: They are fighting in a castle in the present day with futurist style weapons. Yes there will be a verity of weapons. I may actually do an upgrade system where you start out with a sword and as time goes on you earn money and can purchase upgrades. As for my progress on this not much is done yet. There are so many distractions. What I did was create a nice build tool that generates lzma compressed images. This beats the filesize of a png even when I use a 16-bit one channel image with the rgb565 data. It also loads fast. This should help keep the filesize of my program down allowing for more content. Anyway for rendering I am still in the planning stage and I am considering combining voxel drawing with some 3d billboard style graphics such as trees and maybe buildings in the background and render the characters using polygons. I may also add some 3d polygon world elements. For example maybe you could throw a barrel at your opponent and this will made of polygons. No code for this yet but I seriously expect to have a good 3d engine ready by the contest deadline. Tell me what you think. One interesting thing to note is that the font is rendered using freetype2 instead of a bitmap font. Ooh, I like it! Just one thing, and this might just be me, but I strangely prefer when Load Game is first... I dunno why... Keep up the good work! Thank you for the suggestion, I agree. Load game is more likely to occur than new game. I will make the change. Well due to lack of time and my lack of energy to stay up late last night (was already very tired that day and could not do it as in I went to bed at 22:30) and hadn't much time today (Saturday) I was not able to finish my entry on time. I was quite excited for this but had trouble finding time to get it done. I admit that during the duration of this contest my time was not always used in a manner that would enable progression of this such as wasting quite a bit of time on unrelated stuff even reading highly offensive jokes and on youtube or other programming and other fun projects (yes this one is too) and stuff in real life this taking up a majority of my time, what I have just enumerated before was taking into account the remainder of my time. I of course hope to avoid making such a mistake for the next contest. I thank you for welcoming prizm entries and I hope next contest you guys (those who were involved in the contest) do the same. Very interesting discoveries in deed for Prizm with the image algorithm and font rendering. Maybe some type of ebook reader can be based just on those. Have you kept the code for the above or the image bit of the above? 1. Make the game resource-efficient. This is very important if you plan on making a quick-loading game that can be enjoyed at any point in time, even in school. Resource efficiency will also keep battery usage down and boost the fun that the game provides (smoother graphics, quick response...). 2.Add cool weapons such as rainbow lightsabers, bazukas (GTA style), gravity guns (Garry's mod and HL2), death rays (think Nikola Tesla and his death ray), RPG guns, grenades (the more powerful, the better), a laser gun (stormtrooper style),crowbars, etc... (anything you can imagine). 3.Make the graphics, physics and weapon-induced damage as realist as possible while keeping suggestion 1 in mind . 4. Make it possible to instantly return to the calc's home screen with the press of a button!!! THIS IS HIGHLY IMPORTANT FOR IN-CLASS STEALTH GAMING. P.P.S What language are you coding this in?! C++?? On the point of emulator - what may spoil some games is the fact there is no good way to use simultaneous key presses the way they work on real hardware... The emulator is available as 90 days demo on casio site and called fx cg manager plus. Amazonka, I still have all the code. CalcMax, I am most likely not going to complete this. I like dogs better. If you want to play games without the knowledge of your teacher just hide your phone behind your text book or put it in your calculator case. You can play games such as GTA if you have an android. The game had virtually no loading time. It is just like playing a cartridge game. Yes there is some decompression but that takes less than a second. The weapons would have been very cool. I wanted swords and guns with cool particle effects. Yes the graphics would have been good for the Prizm. I was going to employ a combination of voxels, Billboard textures ( perspective transformed textures) and textured polygons. I did not think of implementing a "Boss button" but most Casio Prizm games unintentionally support that because pressing the menu button will cause the game to return to the menu (if using the GetKey function). I was using mostly C with some C++. ProgrammerNerd, do I understand correctly that font(s) need to be supplied within the add-in itself please? I had a look at different txt viewers in the past and noticed some needed to have the files they read altered to use different hexcodes for some of the unsupported by casio characters in order to display them properly... So i wondered if it wouldn't be possible to have the addin itself to do the translation so to say on the fly but i have never enquired about that before - has it ever been discussed somewhere here before? Now i wonder with your font rendering technic would it be easier to support those characters by having them defined in particular order or duplicated for where casio omitted them and vise versa or is it the same problem as with other addins please. Just asking because i was wondering about it when thinking about text viewers available so far. Currently the font is stored in a const array so that way it does not use any ram. You could also mmap a file with Ahelper's code. That would allow multiple add-ins to share the same font. Casio does not use UTF-8 or Unicode so you will need a table to convert it to the equivalent character for the Casio Prizm. You can certainly do this on the fly. Note that the fonts stored in the Casio Prizm firmware are bitmap fonts. If you scale them it will look bad. It would look strange to use some characters from the Casio Prizm firmware and others from a different font unless they look the same. If you want UTF-8 or Unicode and you want a custom font just get a font with international characters and display that using freetype2. © Copyright 2000-2019 Cemetech & Christopher Mitchell :: Page Execution Time: 0.109161 seconds.